Childcare and child development centers have become the places where the majority of young children spend most of their waking hours almost every day of the year. If enrolled as infants less than a year old, the total amount hours spent in centers closely matches those spent in a child’s remaining school career through grade 12. Considering how critical early childhood is to children’s health and future success in life, it can be argued that the environmental quality of early childhood settings where children spend the majority of their time is equally important. The quality of the center outdoor environment is particularly relevant because this is where children can learn to be physically active, can be motivated to play in nature, and feel comfortable outdoors – lifestyle habits that may persist in later life. Childcare centers are highly regulated, policy-sensitive systems. The overall purpose of this research project is to contribute to national effort to improve early childhood outdoor environments. The specific research goal is to identify discriminatory environmental items in preschool play areas to be included in a pilot tool that will rate their potential to produce physical activity when three-to five-year-old children are exposed to them. Currently, no tool exists that links the amount of physical activity and preschool play areas, with the potential of affecting policy. This study will characterize behavior settings, their components and attributes, in terms of the physical activity patterns of an understudied population: preschool childcare centers. The preschool and, more specifically the preschool outdoors is a strong determinant of physical activity. Primary Aim 1: To measure the amount of physical activity (using SOPLAY codes), exhibited by three-to-five-year-old children exposed to different behavior settings present in preschool play areas. Hypothesis 1a: Different outdoor settings in preschool play areas will vary in the amount of physical activity that they afford. Primary Aim 2: To measure the amount of physical activity (using SOPLAY codes), exhibited by three-to-five-year-old children in similar behavior settings across different preschool play areas. Hypothesis 2a: Similar behavior settings across different preschool play areas will not vary in the amount of physical activity they afford. Primary Aim 3: To identify the physical components and attributes common among behavior settings located in preschool play areas that may explain greater amounts of physical activity exhibited by three-to five-year-year old children. Hypothesis 3a: Defined environmental components and attributes associated with greater amounts of physical activity will constitute discriminatory items to assess physical activity affordances in different behavior settings present in preschool play areas. 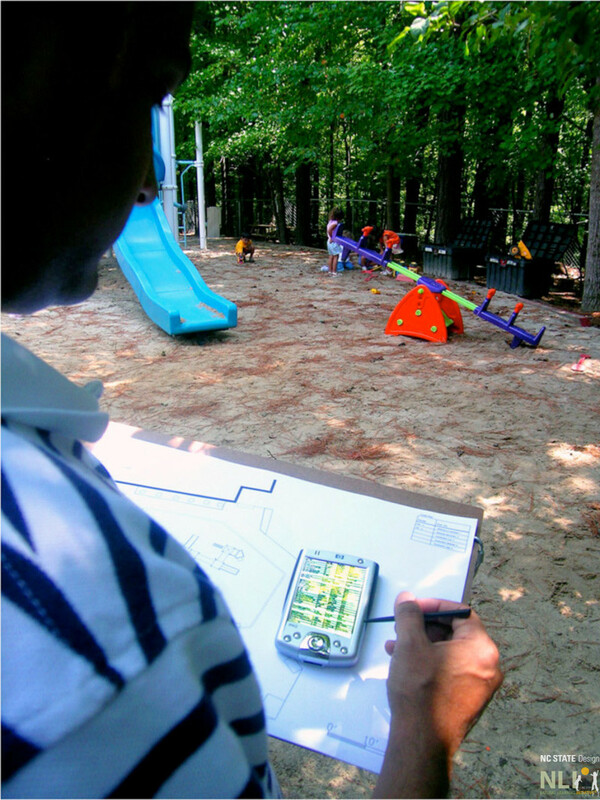 Primary Aim 4: To prepare and pilot test a tool for measuring the physical settings, components, and attributes of preschool outdoor play areas that will rate their potential to produce adequate physical activity when three-to five-year-old children are exposed to them. A preliminary validity check will be performed using the Preschool Outdoor Environment Measuring Scale (POEMS) developed by a team including three members of the current research team (Cosco, Hestenes, & Moore). This study responds to the Strategic Plan for NIH Obesity Research, including the goals to “Assess children’s environments…to determine barriers to increasing physical activity”; to “Identify… environmental and behavioral factors to obesity… prevention… and assess… environments such as… childcare… for specific barriers to increasing physical activity”; and to “Use prospective observational studies to identify modifiable behavioral and environmental determinants of weight gain and obesity in children… [related to] critical periods for inappropriate weight gain” i.e., in childcare centers. Two sets of fifteen NC childcare centers (including respondents to the 2002 Baseline Survey of Environmental Conditions of Outdoor Areas in NC Childcare Centers), matched across urban, suburban and rural contexts, and containing diverse ethnic and socioeconomic groups. The first set used for gathering data to develop the measuring tool. The second set used to pilot test the tool. Preliminary test of reliability and validity.